"Oh mighty tundrastrider! How you and your mighty tusked beast silhouette against the great orange expanse. Thundering footsteps herald your herd. Man and beast blazing trail together." Eventually, one race became smaller in size, but retained their intelligence and became the Nords. The other race grew larger, lost some of their intelligence and became the Giants. This particular belief thrived in the First Era, at a time when Nordic farmers would offer cows as a sacrifice to Giants in order to avoid attacks on livestock, but both the tradition and the ancestral connection belief largely fell out of favor. Despite their primitive appearances, Giants are moderately intelligent, able to fashion tools and clothes for themselves, tend mammoths, and harness fire. Semi-nomadic, Giants travel with herds of mammoths and set up camps across the lands. Their camps are typically decorated with the skulls and tusks of mammoths, alongside various other bones, some of which are used as tripwire chimes to alert them to any intruders. 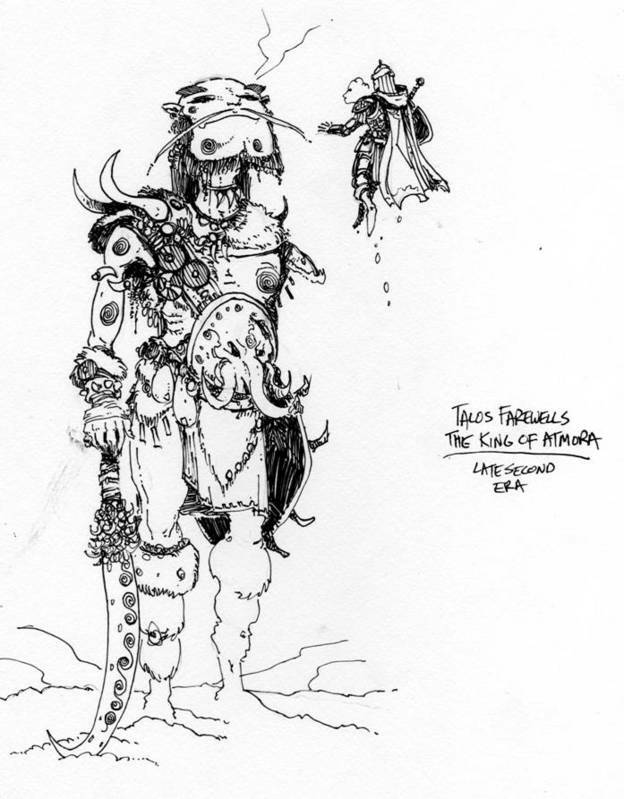 For protection, Giants are known to fashion large, crudely-made clubs of stone, wood and bone and even sets of armor. Despite their rudimentary craftsmanship, they are one of the few races who know of the techniques required to grind the iron-like tusks of mammoths into powder, a prized alchemical ingredient. Some Giants belong to a clan, sometimes numbering in the hundreds, which is ruled by a high chieftain. The clan chieftain's rule is absolute and in times of conflict, they are known to rally their troops and lead organized attacks. If the chieftain is killed, their followers are often left in disarray. Giants typically have a deep and guttural speech, sometimes called Giantish. To the average person it sounds like incomprehensible grunts and roars. Giants tend to be non-hostile to speakers of Giantish. Some Giants, however, have learned to speak rudimentary Tamrielic in order to communicate or trade with people, and a select few have worked with other races as volunteer gladiators or guards. Although Giants have no known written language, they seem to have an affinity for spiral motifs. This particular pattern (shared by ancient Nordic craftsmanship) is often depicted as scars on their torsos, carved into their mammoth's tusks or painted onto various rocks, trees and walls within their encampments. Observers have speculated that this rudimentary art possibly entices females, marks territory or is simply artistic expression. While it's commonly believed that Giants herd mammoths, scholars have observed that their relationship is based more on mutual respect. They are seemingly able to communicate with mammoths, and protect them fiercely. In return, Giants receive companionship and milk, which they process into cheese. Their omnivorous diet also consists of cooked skeever meat, and other animals which they spit-roast over their massive camp fires. Some accounts claim to have witnessed a Giant eat a mammoth, but the meal was conducted with reverence. Giants have been known to gather regularly at a ceremonial site. Here, they come together to trade, mate, and communicate with whatever methods they have developed. Giants also demonstrate intricate beliefs regarding death. They have places set aside as sacred burial grounds, such as Secunda's Kiss in Skyrim. When a Giant is sick or dying, he or she goes to one of these places to die. If a Giant dies elsewhere, other Giants make sure the body gets to the burial ground. They typically don't live near these sacred locations, and they don't guard them. They simply make use of them. Giants share little civil interaction with humans or elves, but are typically free to wander through the lands they inhabit. Giants are wary of, but used to, the presence of other races. They are mostly harmless and keep to themselves when unprovoked, but are also very territorial and will react aggressively on intruding adventurers or wild animals. If provoked, they have been known to fling unlucky intruders up to a league away with their clubs, and some Giants keep trophies from slain invaders. Because Giants have been relatively common throughout Skyrim since time immemorial, their relationship with the Nords is the most prominent, and varies greatly. The Merethic Era was a particularly violent time, according to the earliest accounts. 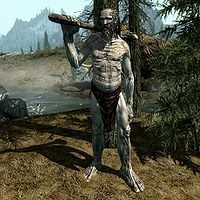 They tell of a powerful Giant named Sinmur who served as the high chieftain of Skyrim's giantish clans. Ysgramor, in his prolonged military expansions into Skyrim, waged war against Sinmur and the Giant clans. Ysgramor purportedly slaughtered hundreds of Giants, and eventually Sinmur himself. 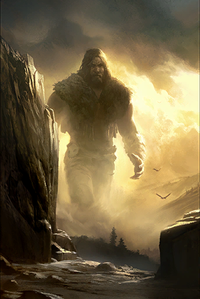 Despite the early conflicts with Nords, the presence of Giants remained throughout the province in the eras that followed, although both races largely kept to themselves. 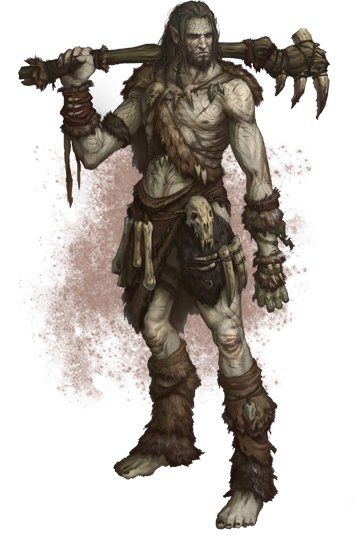 Giants have sometimes been characterized by Nordic villagers as "angry hermits" who attack trespassers on sight. This has resulted in them barricading the pathways leading into the Giant's settlements, preventing anyone from accidentally wandering into the area. Some Nords treat the Giants as a nuisance, steal their grazing lands, and even hunt their mammoths for sport. During the Alliance War in the Second Era, a clan of Giants went to war with the Stormfist Clan over stolen territory and mammoths. During the Stormcloak Rebellion in Skyrim, a clan of Giants who were driven out of their lands began to attack settlements as a result. Both the Companions and the Fighter's Guild readily accept contracts to deal with Giants that have been troubling the population. Similarly, the Jarls of Skyrim have been known to send their forces out to kill a Giant that has wandered too close to a settlement. While it may seem the aggressors are almost always the Nords, Giants sometimes play a part in disrupting the peace. Giants can sense weakness and intrude on territory if the opportunity presents itself. They sometimes take livestock from farms, or on rare occasions steal valuable items from the populace. If led by a chieftain, they can be particularly dangerous in large numbers. Conversely, other Nords are content to have Giants living within their borders. Some even consider them as distant cousins that should be respected, or write poetry honoring them. Some Nordic farmers uphold a long-standing, albeit uncommon, tradition of annually offering cows as a sacrifice to nearby Giants in order to avoid attacks on livestock. Traditionally, the cows are painted with swirls Giants are so fond of, so that they recognize them as peace offerings. In the Fourth Era, Giants were viewed as a serious problem in the Pale region of Skyrim, but the Empire decreed they be left alone. Certain Giants have been given special permission to keep their campsites, but disturbing or trading with them is forbidden. Certain Giant body parts are known to be valuable alchemical ingredients and are much sought after by apothecaries, specifically the toes, thumbs and molars. Because the freshness and condition of the body parts are important, some alchemists have drafted harvesting guidelines for enterprising adventurers who may have recently slain a Giant. The benefits that Giant's body parts provide in both potions and enchantments are numerous. Giant's toes can bolster health and strength, at the cost of weakening stamina. Molars are known to bolster combat abilities, and thumbs can imbue a weapon with a pestilent vapor. Less common is the consumption of Giant's blood, which results in diminution. A fungus purportedly grows in the Giant's armpits that can be used as a strong narcotic. Giants, albeit very rarely, are able to reproduce with humans. One such example of this is Lyris Titanborn, a half-Giant Nord who claims to have Giantish ancestry. It is unknown whether or not they are able to reproduce with the other races of men or even mer. According to Nordic myth, Ysgramor was said to have collected the laments of the "Giant-Wives" while in Atmora, and had them twisted into a bowstring for his fabled bow. Scholars believe that the term "Dwarves" is of Giantish origins, and one that was used in affection towards the Dwemer, whom they perceived as unusually small. Legends regarding the mysterious caves of Breagha-Fin reveal it to be inhabited by skeletal Giants and ghost-mammoths. Frost Giants are a sentient race comparable to Giants, but it is unknown if they are related in any way. Similarly, the Ilyadi were an extinct race of forest-dwelling giants native to the Summerset Isles, known for the multiple eyes which covered their heads. In Elsweyr, the Halls of Colossus was believed to be built in honor of an unspecified race of giants, although some say that it was built by the giants themselves. By the Third Era, these giants had not been seen in the land for many years. 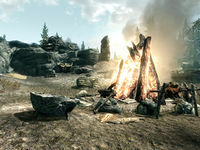 For game-specific information, see the Daggerfall, Skyrim, ESO and Legends articles. ^ The Seven Fights of The Aldudagga: Fight Six, "The 911th Cow"
This page was last modified on 14 January 2019, at 22:28.